Besides being a busy time with emergency calls, Fire Prevention Week was highlighted by three fire safety programs. On Friday, October 9, a group of almost 30 youngsters from St. John's Nursery School, and quite a few parents and teachers, attended a morning of fire safety education. There were also demonstrations of fire and rescue equipment. Here Ladder 4621 discharges water from a ladder pipe while children and parents watch. Below left a group from The Wonder Kids Day Care Center watch as Bert and Ernie talk about the importance of having a home fire evacuation plan. Below right a contingent from the East Allen Township Volunteer Fire Department in Class A uniforms attended a special church service at Peter's UCC Church to honor the fire fighters and their families. A children's group from the church put on a delightful skit with songs for the group of fire fighters. Prior to the service, the members of the fire department provided the children with a show-and-tell session on fire safety. Following the service everyone enjoyed cake, refreshments and goodwill. 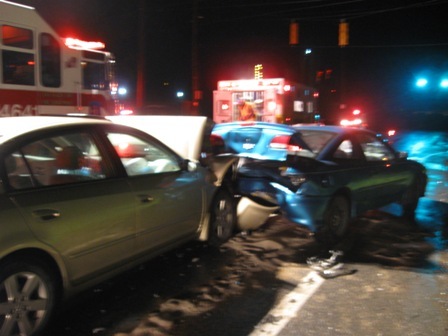 On Saturday, June 20, 2009, At 21:35 hours, EAFD was dispatched for MVA with three injuries. Fire Chief 4651 arrived on scene and took command. Upon arrival of Rescue 4641 on scene, all patients were out of the vehicles. Crews from Rescue 4641, QRV 4642, Ladder 4621, and Engine 4511 (Allen Twp.) 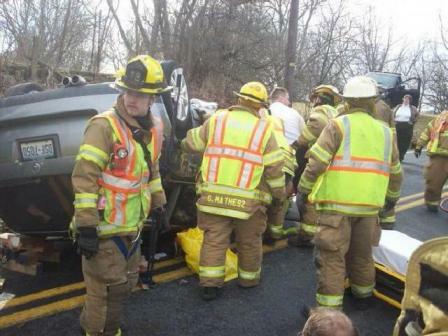 provided spill control, traffic control, and assisted EMS 46. The units cleared the scene within 1 hour. On Wednesday, June 3, 2009, At 17:11 hours, EAFD was dispatched for MVA with possible injuries. Upon arrival of Rescue 4641 on scene, found one vehicle in the roadway with heavy driver's side damage and a second vehicle down the embankment. Crews from Rescue 4641 disconnected the battery from the vehicles. Engine 4511 (Allen Twp.) and Rescue 4541 arrived on the scene. Both crews provided spill control. The units cleared the scene within 1 hour. MVA with entrapment on Nor-Bath Blvd. On Wednesday, March 25, 2009, At 07:21 hours, EAFD was dispatched for an MVA with entrapment. Upon arrival of Rescue 4641, a pick-up truck was on its left side. The driver was entrapped. The vehicle stabilization to prevent movement was provided by crews from Engine 4511. Crews from Rescue 4641 and Engine 4611 had to cut the roof off the vehicle to extricate the patient. The units cleared the scene within 1 hour. On Monday, March 23, 2009, At 17:27 hours, EAFD was dispatched for Ladder 4621 to assist Allen Twp. Fire Co. for a Chimney Fire. The units cleared the scene within 1 hour 30 minutes. On Monday, March 23, 2009, At 08:44 hours, EAFD was dispatched for Ladder 4621 to assist Northampton Fire Dept. on a 2nd Alarm for a working structure fire. The units cleared the scene within 2 hours 20 minutes. MVA with entrapment on Weaversville Rd. 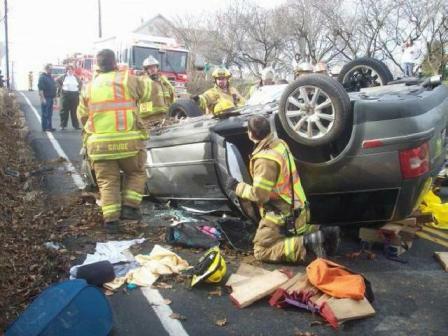 On Thursday, March 19, 2009, At 16:25 hours, EAFD was dispatched for an MVA with entrapment. Fire Chief 4651 arrived on scene and took command. The vehicle struck a pole and rolled over. Crews from Rescue 4641 and Engine 4511 (Allen Twp.) used the Jaws of Life to access the passenger side front door to extricate the patient. The units cleared the scene within 1 hour. On Monday, March 16, 2009, At 13:05 hours, EAFD was dispatched for Tanker 4631 to respond to working barn fire with Hanover Lehigh County Station 33. On Friday, February 27, 2009, At 19:44 hours, EAFD was dispatched to a vehicle fire in Greenbriar Village. Quickly the call was updated to fully involved car fire within close proximity to the dwelling. A further update indicated that there were handicapped residents in the home and that the home was now involved in the fire. To make matters worse there was a report that the only available escape route was down a ramp which was now blocked by fire. Fire Chief 4651 and Fire Police Capt. 4691 arrived first on scene. Chief 4651 wasted no time requesting a full response from Bath Fire Station 40. As reports of the worsening fire were received, he also requested a full response from Hanover Township N.C. Station 15 and a RIT (Rapid Intervention Team) team from Hecktown Station 53. Fortunately quick action removed the residents from danger and prevented the situation from getting worse. The car involved was largely consumed by fire but the home only sustained damage to the siding. A second vehicle was slightly damaged. We appreciate the help of neighbors and the fast response of our mutual aid fire companies. 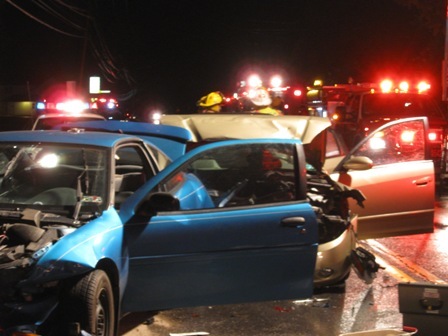 Engine 4611 and Rescue 4641 responded from East Allen Township Fire Department. On Sunday, January 18, 2009, At 22:07 hours, EAFD was dispatched to a dwelling fire at Chenango Drive. Engine 4611 arrived first on scene. Crews from Engine 4611 and Rescue 4641 entered the dwelling and checked for smoke and carbon monoxide. We found high levels of carbon monoxide. The units cleared the scene within 1 hour 30 minutes. On Tuesday, January 13, 2009, At 12:30 hours, EAFD was dispatched to MVA with entrapment. Rescue 4641 arrived first on scene Jaws of Life were used to remove victim from one car in a two vehicle accident. On Monday, January 12, 2009, At 13:12 hours, East Allen Sta. 46 and Hanover N.C. Sta. 15 were dispatched to commercial structure fire. Fire Police Capt. 4691 was first arrived and reported smoke inside of the building. Assistant Chief 4652 requested a response from Allen Sta. 45 for manpower. Investigation revealed a malfunctioning piece of medical equipment was responsible. There were no injuries. The animal hospital staff did an excellent job of evacuating all staff, pet owners and pets. On Monday, January 5, 2009, the 2008 award for Fire Fighter of the Year was presented to Assistant Chief/President Raymond Anthony.